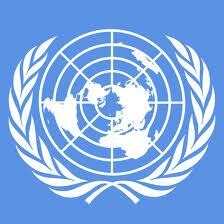 Since its creation, there has been controversy and criticism of the United Nations Organization. In the United States, an early opponent of the UN was the John Birch Society, which began a "get US out of the UN" campaign and even as far back as 1959, charging that the UN's aim was to establish a "One World Government." The United Nations was established in 1945 to maintain international peace and promote cooperation in solving international economic, social and humanitarian problems. Well its charter does not include taking sides and carving up the spoils in a number of nasty wars, and picking and choosing what human rights it might or might not champion. De Gaulle criticized the UN, famously calling it le machin ("the thingie"), an apt name. There are 5 permanent members – China, France, Russia, the United Kingdom and the United States and it allows a permanent member to block adoption but not to block the debate of a resolution unacceptable to it. China blocks adoptions concerning sanctions against Iran and on the sending of UN peacekeepers to the Sudan as both countries supply their oil needs, but does agree to sending in an African Union contingent to the Sudan who could not even afford bullets and who stood on the sidelines like spectators at a girls basketball match and did nothing to stop the genocide by the government sponsored Janjaweed. They also block meaningful sanctions against North Korea and get belligerent over any debate on their invasion of Tibet. The ethnic cleansing of the Burmese Karen people by the Burmese generals has been going on for years; problem is Burma supplies China with oil. The UN looks the other way. Apart from Russia no western country was critical of the bombing of Serbia and the annexation of part of that country which was handed over by the victors, the US and the British, to form a new Muslim country called Kosovo. Another warring conflict ended in a similar land grab in the Sudetenland 92 years preciously. Perhaps Serbia had seen the writing on the wall. United Nations Declaration on Rights of Indigenous Peoples. This Human rights declaration is a complete fiasco. This declaration is criminally ignored where European indigenous people rights are concerned. This declaration emphasizes without any pre-conditions the rights of indigenous peoples to maintain and strengthen their own institutions, cultures and traditions and to pursue their development in keeping with their own needs and aspirations. The overpowering of their societies by deliberate, calculated swamping of its countries is meant to frustrate this. Thus this declaration is negated. The Government of the United Kingdom, who is a signatory to this declaration, openly and criminally ignores and even threatens its people with incarceration who wish to maintain and strengthen their own institutions, cultures and traditions and to pursue their development in keeping with their own needs and aspirations. On the contrary it blatantly attempts to weaken and destroy the indigenous people’s pursuit to maintain their own needs, identities and aspirations and even forms government Quango’s for that sole purpose. Not only do they ignore these basic human rights, they are even attempting to deny an indigenous race exist at all in the UK. This high sounding, moralistic human rights nonsense failed the people of Tibet, the Sudan, Burma and Serbia miserably, but they were not super powers were they. There was no call for sanctions when the coalition of the willing illegally invaded Iraq which was NOT a UN initiative, but over a million Iraqi civilians have paid dearly with their lives and who are still dying because of this discrimination by the UN. It is imperative that the idea of the formation of a United Nationalist Nations (UNN) is formed without delay to act as a real watchdog for the rights of Indigenous Peoples worldwide, performing the duty that the UN refuses to accept or just ignores. Like the UN it should not be a political party or seen to be a political party or have any political affiliations. It should be formed as a world-wide organization with its own Ambassador and representatives. It might well be that in 1959 the John Birch society got it right when they said that the UN's aim was to establish a "One World Government." It could be part of an enormous jigsaw aimed at slowly over time forming a one world government. Common Purpose, another part of this complex jigsaw tries to hide its ‘purpose’ behind its charity status. It declares it offers inspirations, knowledge and connections, leadership and development skills and I am sure they do, but why its courses are conducted under Chatham House rules completely escapes me, what have they got to hide? Common Purpose was founded in 1988 by Julia Middleton. She is also the CEO of CP. She was tutored at the London School of Economics, a hotbed of rabid socialism and Marxism; many of its past graduates are now working within politics. A number of senior BBC staff are LSE educated and graduates of CP courses. Incidentally The LSE was founded by the Fabians Society. There is enough proof that the day the NWO is a reality Common Purpose will take over the reigns of the civil service. Its tentacles spread large and wide and no doubt it has connections already within the Judiciary, higher echelons of the British police, media, and senior representatives of the existing civil service. Robert Peston, BBC Business Editor, said of Julia: “One of Middleton's great skills is to persuade police constables, youth group organisers, permanent secretaries, FTSE chief executives and head teachers that they can learn from each other and could even cure some of society's ills.” In preparation for what purpose I ask. The purpose of the UNN should be to alert the world to the plight of indigenous people around the world, including European people, where the sheer overwhelming weight of immigrant numbers will in time assure the displacement and fragmentation of their people and their cultures. The UNN should fill the void where the UN has failed to protect the rights of the indigenous people around the world. Our successive governments cannot justify turning its back on the rights of the indigenous peoples with the poor excuse that ‘celebrating our traditions and wanting to be recognised as the indigenous group of these islands might provoke and offend the sensitivities of alien people of alien cultures’ That is treason. We cannot even begin to understand the terminal sickness affecting the Western Nations until we understand WHY this is happening. Two years on from writing this article the UN Security Council have stood by while two of their voting members Russia and China have vetoed moves by the UN to institute a no-fly zone and to put peacekeeping troops on the ground in Syria to stop the slaughter of civilians that at present total approx. 15,000 civilians. Regardless who are the aggressors, freedom fighters or terrorists thousands of innocent civilians are being systematically murdered. These two Security Council members use their veto not because of humanitarian reasons but Syria is Russia’s largests arms buyer and China’s veto ensures continuous uninterrupted supplies of oil from Syria for their growing economy. Let us remind ourselves of Article One of the UN Charter. This is Article One and it is totally MEANINGLESS, The Genocide in South Africa is also being ignored.